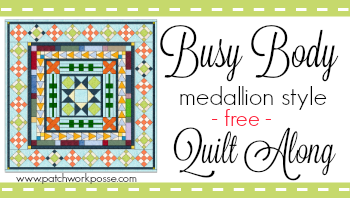 1) Grab 2 background squares and 2 patterned squares. 2 backgrounds, and 2 pattered squares on top of each other. All 4 pieces will be stacked. Do this for each block. Make sure the sides are all lined up nicely. 3) Lay your ruler on top of the pile at an angle. We are not making these perfect they are cranky! You want to be at least 1 inch from the corners. fabric with one background piece. Make sure you don’t turn them!! 6) Taking the two on the top, match up their cut edge. Your tips need to be peaking out from the edge. 8) Sew the top 2 together, repeat for the bottom 2. The outsides will not match!! Make sure you are lining up the centers when sewing. 9) Sew the top and bottom pieces together. The center point will NOT match. Neither will the outside edges. Repeat for a total of 8 blocks. Sew these together to make one strip for the quilt. Take a peak at some of last months cranky log cabin blocks. The lady on the right brought this to quilt group last night. had to share. 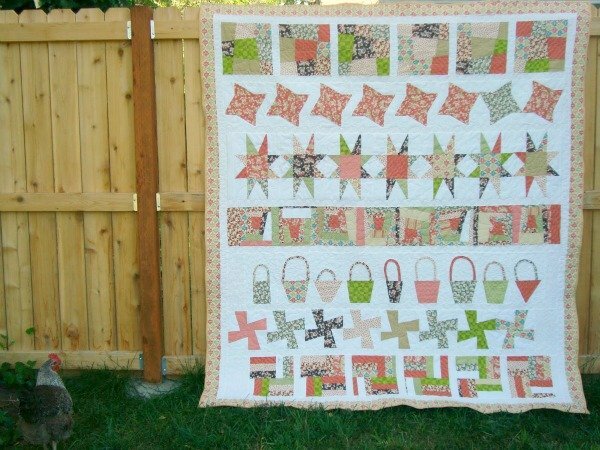 She says that she has always quilted quilts, but never peiced them. So this is her FIRST pieced quilt!!! I of course asked her 1-will you ever piece again, and 2- will you ever make another triangle. W.O.W. I didn’t get the back which showed off her fantastic quilting. in the ditch + another echo. crazy wonderful. Love this! Thank you for sharing your tutorial! I clicked on the link for the 2-page printable pattern, but it’s not working any longer! Well, bummer!